We all consist of 10 times more bacteria than human cells. Every living being and place has its own unique and personal microbiological fingerprint. 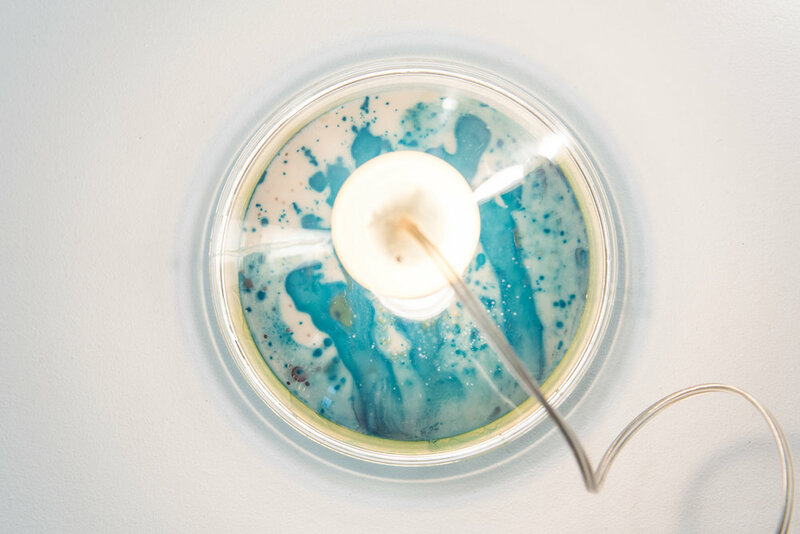 In a crossover between science, art, and industrial design, the bacteria lamp uses this fact to create stand out conversational pieces. Samples are taken from people, places or things that hold a position of importance, and are grown into a unique piece in the form of commissioned work. May it be the location of a first date, a personal souvenir from a memorable journey, or the reminder of loved one far away - the possibilities are as individual as each one of us. After a growth period of 24 to 48 hours, the microorganisms are fully sealed within resin to stop the growth and to preserve them for eternity. An LED light source incorporated into a custom silicone plug highlights the visual quality of the growth pattern and colors from above or below. Mouth blown in the south of Sweden, the form language of the vessel is reminiscent of classic laboratory material, and together with the silicone plug, they form a unity that makes them an atmospheric piece in anyone’s home. For a digital press kit or to use bacteria lamp in your photo shoots, please contact us here. For additional bacteria lamp images, please visit work.